Tough, flexible cloth backing for sanding hard-to-reach areas. Long-lasting, fast cutting. Use for de-burring and metal finishing. Jaco Aerospace and Industrial is your one stop resource for 3M(TM) Abrasive Cloth Sanding Roll, 03131, 1 in x 6 ft, Fine, 1 roll per pack, 10 packs per case and all of your 3M Products, Tapes, aerospace and industrial needs. 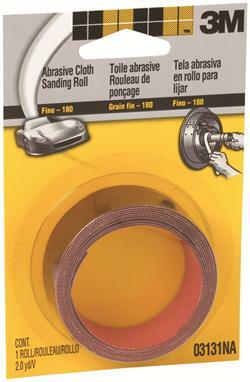 SKU Marketplace Product Description: Tough, flexible cloth backing for sanding hard-to-reach areas. Long-lasting, fast cutting. Use for de-burring and metal finishing.